Got a case of Mondays? Stuck in traffic all morning and worried about the traffic on the way home? 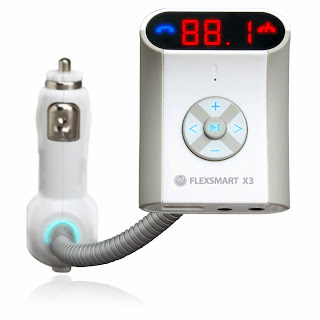 The FlexSMART X3 may be the perfect solution to get your week started off right! The X3 is a beautiful device that compliments any vehicle - Why not let it ride shotgun with you? The New and Improved GOgroove FlexSMART X3 delivers enhanced audio clarity and easy pairing technology for seamless hands-free calling, stunning wireless audio playback, and ultimate Bluetooth performance. The X3 is equipped with AUTO-SCAN to automatically find an ideal FM station and easy-pairing lets you sync in seconds. A2DP enhanced clarity technology provides crystal clear audio for music and phone calls. With the voice-detection microphone, you can ensure that everyone can hear what you are saying. Additionally, if a phone call comes in while listening to music, the X3 will automatically fade out from the music and restart once the call is over. Boasting features like USB charging port and auxiliary LINE-IN and LINE-OUT, you can charge nearly any device, connect wired audio devices, or equip your car stereo with stunning Bluetooth connectivity through its 3.5mm audio jack. The redesigned, ultra-sleek form factor and ALL NEW precision button controls make for a truly beautiful device that compliments any vehicle. Fine tuning the ultimate wireless audio experience is easier and more convenient than ever before. Across the U.S., the rules on phone use in cars are getting stricter and stricter. Not to mention it is unsafe to use a device without hands-free or Bluetooth capabilities. Why not be safe and enjoy your ride with the FlexSMART X3? It’s the easy and smart way to get you through that weekly traffic. If you want to be in the know about great deals, you can sign up for our Weekly Newsletter!That’s where you’ll be the first to know about new products, special discounts, exclusive promotions and more! Don’t forget to subscribe to us on Youtube, like us on Facebook, and follow us on Twitter for even more great deals!